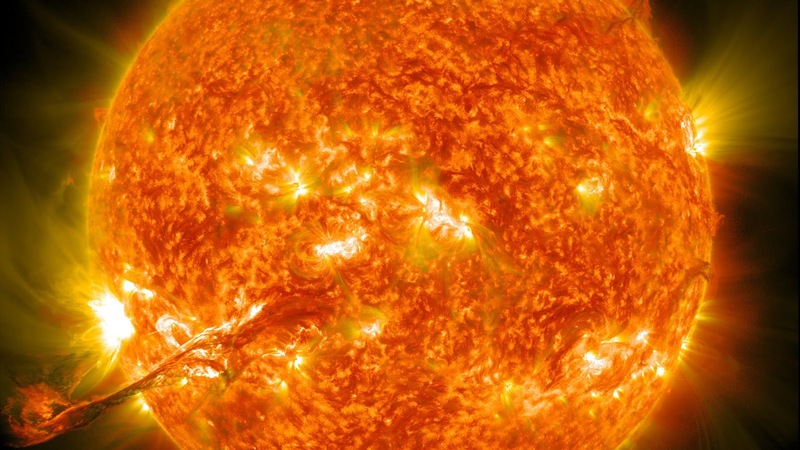 One of the biggest mysteries about our sun is why the corona, the upper part of the solar atmosphere is known, can be thousands of times hotter than the surface of the sun itself. It’s as though the air around a scorching, burning fireplace is hotter than the flames. While activity such as solar flares and coronal mass ejections can inject large amounts of energy into the corona, these events are too infrequent to maintain the consistently high temperatures found there. For decades, scientists have been studying the mechanisms of coronal heat generation and transfer in an attempt to understand this phenomenon. While several ideas have been proposed, the leading theory for the last few years has focused on what solar physicists call “nanoflares.” These are tiny explosions on the sun's surface that occur almost non-stop. Nanoflares are a billion times less energetic than ordinary flares and are so small that they can’t be observed with current telescopes or spacecraft. Scientists have also theorized that they take place on regions of the sun that have no other type of eruptive activity. While the sun emits light in many wavelengths, researchers have proposed that the spectrum of light emitted from nanoflares would be in the high energy X-rays, known as hard X-rays. No, currently operating spacecraft has the specialized X-ray optics needed to make observations of hard X-rays. But in December 2014, the FOXSI mission launched aboard a NASA Black Brant IX suborbital sounding rocket from the White Sands Missile Range in New Mexico. It made a 15-minute flight, gathering six minutes of data with very sensitive hard X-ray optics to observe the sun. The payload flew to an altitude of 210 miles (337 km) before descending by parachute to Earth, where it was recovered. FOXSI made the detection of very hot solar plasma above a region of the sun that was exhibiting no other eruptive activity, suggesting the presence of nanoflares. “Usually, we observe a solar flare as a brightening, intensity increase,” Shin- nosuke Ishikawa, from the Institute of Space and Astronautical Science at the Japan Aerospace Exploration Agency (JAXA), said. Ishikawa is the lead author of a study of the FOXSI observations, published in Nature Astronomy. Ishikawa, Christe, and their colleagues identified the very energetic X-rays, a signature of plasma heated at more than 10 million degrees Kelvin, and concluded that such heated plasma could be generated only by the action of nanoflares. “This observation provides the most direct evidence to date for the presence of hot plasma in a quiescent solar active region,” the team wrote in their paper. They corroborated FOXSI data with data from other spacecraft, such as one of the GOES satellites and the X-ray telescope onboard Japan’s Hinode satellite, to verify that no brightening was detected in other wavelengths. They also checked data from NASA’s Solar Dynamics Observatory taken at the same time to look at other basic features of the region. Viewing the faint nanoflares requires extra-sensitive optics. Observing high energy X-rays streaming from the sun is extremely difficult because these wavelengths cannot be focused with conventional lenses, as visible light can. When X-rays encounter most materials — including a standard glass lens — they usually pass right through or are absorbed. Therefore, regular lenses can't be used to adjust the X-ray's path and focus the incoming light. FOXSI carried grazing-incidence optics, which haven't been used on any previous solar-observing instruments. This employs mirrors that can successfully cause X-rays to reflect, as long as the mirrors are nearly parallel to the incoming X-rays. Several of these mirrors in combination help collect the X-ray light before funnelling it to the detector. This focusing makes faint events appear brighter and crisper and allowed for the detection of the super-heated X-ray plasma. Dean Pesnell, the project scientist for the Solar Dynamics Observatory, who wasn't involved with the FOXSI study, once compared the tiny nanoflares that happen almost constantly near the surface of the sun to heating elements in an electric blanket. With the FOXSI observations seemingly confirming the presence of nanoflares, scientists hope to do more studies to help understand the mechanism of nanoflares, as well as figuring out more details of the temperature disparity between the sun’s surface — or photosphere — and the corona. Ishakawa and his team hope to do observations with future launches of FOXSI, as well as future instruments on upcoming spacecraft to do more targeted X-ray observational campaigns.